The Neuropatholator Touch Starter Screen replaces the 34 year hit wonder the Neuropatholator System 3. 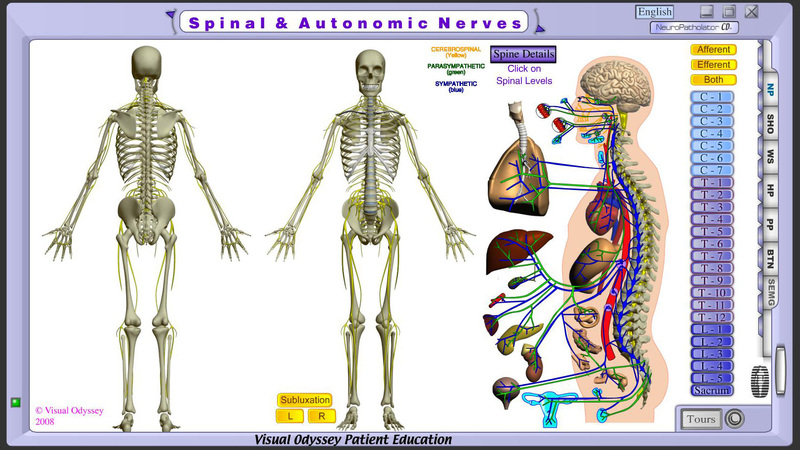 It shows the Autonomic and Spinal Nerves on one screen. Activating a spinal level shows nerve innervation to the organs and peripheral nerve pathways to correlate and emphasize the immediate conditions and long-term possible consequences. With a mouse or touchscreen monitor, the experience is instant, dramatic and memorable. Now, SAVE about 90% of that wall chart investment and turn your Windows PC into a Neuropatholator and reap: realization, retention, referrals and revenue!! To see a video of the Starter Click Here! * Upgrade to the Core, Bronze, Silver or Gold at anytime.